A curious bidding war has been going on in London in the last few years: who can say the rudest thing about Euston Station. Last year, when it emerged that Euston’s 1960s building might be remodelled rather than demolished, Building Design columnist Ike Ijeh said that it was “relentlessly unlovable” and that “its coffin-like envelope, monolithic character, gloomy atmosphere and sterile public realm conspire to form an astonishingly dismal dystopia that seethes with architectural spite and aggression”. Writing in The Times back in 2007, Richard Morrison thundered that “even by the bleak standards of Sixties architecture, Euston is one of the nastiest concrete boxes in London: devoid of any decorative merit; seemingly concocted to induce maximum angst among passengers; and a blight on surrounding streets. The design should never have left the drawing-board…. It gives the impression of having been scribbled on the back of a soiled paper bag by a thuggish android with a grudge against humanity and a vampiric loathing of sunlight”. I think that means he doesn’t like it. The station has been variously described by others as “hideous”, “a dingy, grey, horizontal nothingness”, “an ugly desecration of a formerly impressive building”, a reflection of “the tawdry glamour of its time”, entirely lacking of “the sense of occasion, of adventure, that the great Victorian termini gave to the traveller”, and “the worst of the central London terminuses, both ugly and unfriendly to use”. Local politicians agree. According to Sarah Hayward, Leader of Camden Council, Euston is “past its shelf-life” and “a barrier to effective regeneration of the immediate surrounding area”. Plans to refurbish the station rather than rebuild it are “ill conceived and poorly-planned” and “amount to a shed being bolted on to an existing lean-to”, offering “no regeneration or economic benefits”. Valerie Leach, the councillor in charge of regeneration in Camden until last May, has said that Euston is “a total nightmare” that “has to be completely redone.” The council’s Euston Area Plan says the station is “poorly designed and has a poor relationship with the surrounding streets and neighbourhoods”. English Heritage, which recently rejected a bid from the Twentieth Century Society to list the station, has damned it with faint praise: although Euston is “a rare example of a major terminus of post-war date… not without merit, especially as regards the lofty main circulation hall”, its assessment added that “other important elements – notably the train shed – are disappointing”, the station’s plan “is seldom given any memorable architectural expression,” and “its lucidity is compromised by later interventions”. In architect-speak “disappointing” is often code for “worthless”: Euston may indeed be a rare survival, but from a period in architectural – and railway – history that many would rather forget. The fate of the original Euston station, built by Philip Hardwick in the 1830s and 1840s and arguably the world’s first large inner-city rail terminus, is a familiar story. But no matter how many times it is retold it still shocks. Hardwick’s station had survived abortive rebuilding plans in the 1890s and 1930s, and World War Two bombing, but British Rail’s vision of a modern railway had no room either for Hardwick’s Arch of 1837 that fronted Euston Road (in fact not an arch at all, but a propylaeum or gateway), or his Great Hall of 1849 – an extraordinary space that made New York’s Grand Central Terminal look puny. Both were hastily demolished in 1962 despite the opposition of the nascent conservation movement. The new Euston Station, designed by WR Headley and RL Moorcroft of British Rail’s London Midland Region, has been reviled ever since it was opened by the Queen in October 1968. Macmillan refused to intervene and the demolition contractor Frank Valori later presented a silver model of the Arch to Lord Esher, chairman of the newly-formed Victorian Society, who admitted that the gesture “made him feel as if some man had murdered his wife and then presented him with her bust”. According to the Euston Arch Trust, Valori incorporated part of the Arch into the stonework of a house he constructed for himself in suburban Bromley. Most of the rest of it was, incredibly, dumped in the Prescott Channel, a canal that runs into the River Lea in the East End. Given the unspeakable decision to demolish the Arch it’s odd to learn that far from heaping scorn on the old one, the new station paid tribute to it. A fascinating official brochure for the 1968 station (on the Euston Arch campaign website, although a much clearer version can be read on the website of the Barrymore Model Railway Group, a bunch of Cheshire train buffs) describes the Great Hall as “truly magnificent” and implies regret for the perceived need to demolish it. The new station was intended, however misguidedly, to continue the tradition of great Victorian railway architecture rather than erase it. Moorcroft’s huge new Concourse (or Circulation Hall) may not have been consciously modelled on Hardwick’s Great Hall but it was described as the “central feature…. planned to accommodate, without crowding or congestion, the maximum number of passengers likely to use the station at peak periods”. Much pride was taken in the Concourse’s extensive glazing and the Sprig Buffet and Grill Room on its east side, both of which are long closed and replaced by an identikit food court and the Britannia Pub upstairs. (For those wanting to know more, there’s a good history of the station’s rebuilding on the Black Cab London blog, and some great images both of the old Euston and the 1930s rebuilding proposal on Liam Houghton’s blog). Many ideas have been put forward since 2007 for how to rebuild Euston – but all of them amount to little more than a shopping mall surrounded by office blocks. Why can’t a station be a station? Less than forty years after its completion, in 2007 Network Rail announced that it had selected British Land as its “preferred development partner” with whom to completely redevelop Euston Station. It’s worth noting that this was before Euston was earmarked as the London terminus of a new High Speed 2 (HS2) Line to the Midlands and north: rather than make room for HS2, the purpose of the rebuilding was to “unlock the commercial development potential of the site”. Money talks. In 2008 developer Sydney and London Properties put forward a rival “Vision Masterplan” for a new station with a shopping-mall style concourse flanked by glass wedges, later modified into a forest of office and residential towers much higher than those that currently flank the station. Although a new open space between these blocks would be created this would be above the station platforms which would remain just as gloomy as they are today. But it now looks likely that, like it or loathe it, the 1960s Euston will be spared demolition, albeit out of economy rather than a new-found reverence for its architecture. 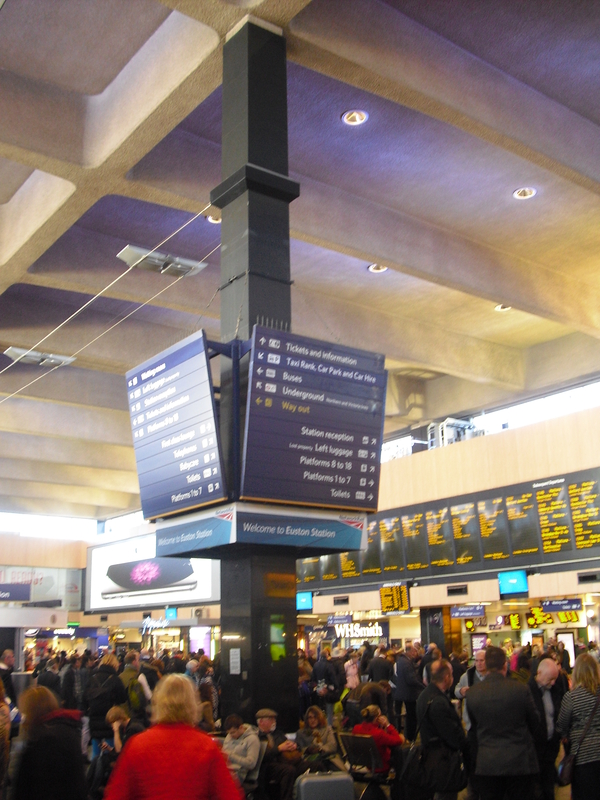 In April 2013 Network Rail unexpectedly announced that its plans to completely redevelop Euston had been shelved – instead it said the station would be remodelled. In February 2014, there seemed to be a further u-turn when Chancellor George Osborne hinted that the money might be found for a complete rebuild after all, once HS2 is completed. But this prospect was short-lived: Network Rail announced in November 2014 that the station’s rebuilding is “not a fundable solution”. News that HS2 may go ahead without the need to demolish Euston has caused much hysteria locally, and nationally, in the last year. The Labour Party’s ongoing search for a parliamentary candidate for Holborn and St Pancras, the safe seat covering Euston where Frank Dobson is standing down in 2015, has added fuel to the fire (Sarah Hayward is a leading contender). She and other potential candidates are queuing up to poor scorn on HS2 and the demolition of 477 homes near Euston that it requires. One of Hayward’s rivals, former Director of Public Prosecutions Keir Starmer, has even said that HS2 breaches the European Convention on Human Rights because the consultation, and the offers of compensation, are faulty. Despite widespread opposition to HS2, both locally and nationally, many locals argue that while HS2 is unnecessary and destructive, at least it would rid us of the ugly concrete monstrosity of Euston station – a price worth paying for all the homes and businesses that have to be demolished for the HS2 line. Both assumptions are wrong. Not only is HS2 an essential bit of infrastructure – the kind of high-speed railway that France and Germany started building back in the 1970s, which Britain is only getting round to now – but the demolition of the current Euston station would be a regrettable consequence. It’s time to look again at the station and assess it objectively, not rely on the oft-repeated scorn that has been poured over it for 45 years. Politicians are right up to oppose the demolition of homes and businesses near Euston that HS2 might require, but I can’t see why they are so keen to demand the demolition of the station itself. With about 80 million passengers a year, Euston is still only the sixth busiest station in London (Waterloo, Victoria, Liverpool Street, London Bridge and Charing Cross all have more). But Euston’s passenger numbers are increasing faster than any other London terminus, a trend that will only accelerate once HS2 starts running on 2026. By 2037 Euston is forecast to have nearly 120 million passengers a year, 50% more than now. Yet Euston rarely feels as overcrowded as other London stations: it was built with a great deal of spare capacity on its 18 platforms (13 of them will be retained under the latest plans, with 11 new HS2 platforms built alongside to the west). 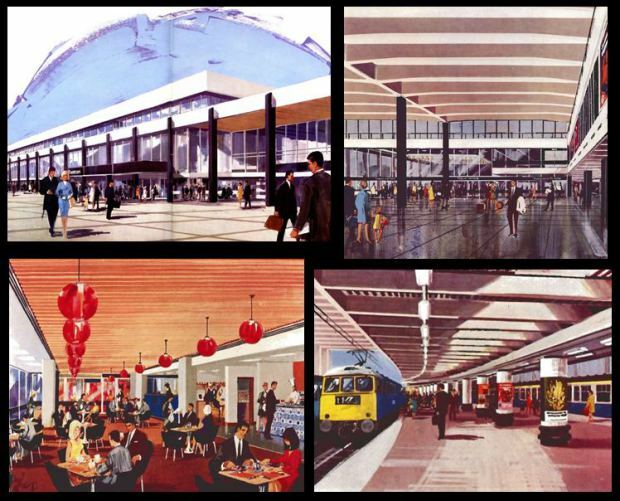 The 1960s architects’ decision to place a mail terminal above the passenger platforms is a highly economical use of space (although it would have been better the other way around, to allow passengers some natural light). The sorting office is now closed and the space is let out to various companies (one of which washes up dirty Eurostar cutlery there) but Euston has recently started handling freight again and it’s even been suggested that its double-deck design means that HS2 could be accommodated without the need for any demolition of nearby homes. It’s a commonplace observation that 1960s architecture ages badly but Euston shows that 60s railway buildings can age – and adapt – much better than those of later decades (look at Nicholas Grimshaw’s Eurostar terminal at Waterloo: built in the early 1990s, closed in the late noughties when Eurostar switched to St Pancras, and mothballed ever since). There is a richness, unexpected luxury and sense of scale at Euston that defies all the brickbats thrown at it. I love the simplicity of the black granite plaque (currently hidden by the building works) whose simple seriffed typeface – Times, by the look of it – states that “This station was opened by HER MAJESTY THE QUEEN on the 14th October 1968”. There’s nothing else on the plaque – not even the name Euston. The plaque is a model of economy and simplicity, rather like the station itself. I love the sea-green stone flooring that looks like a glass aquarium wall in dappled sunlight. I love the diagonal wooden fretting on the ceilings, and the suspended bafflers in the Booking Hall (or Travel Centre as it is now called). Above all I love the huge scale of Euston’s Concourse – never dubbed a Grand Hall out of reverence to Hardwick’s original – and its concrete coffered ceiling, theatrically lit with yellow and purplish hues. The ceiling is high that distant corners almost seem blurred, as in an ancient cathedral: indeed it has clerestory windows on all four sides which, far from showing a “vampiric loathing of sunlight” flood the place with it. Far from being “anodyne and inhuman” as Ike Ijeh claims, the modern Euston offers one of the best – if not the best – station concourses in London after St Pancras. The concourses at Charing Cross, Paddington and Marylebone are impressive top-lit spaces but all three are an incoherent L-shape; Victoria’s concourse is really two concourses knocked together as one and later ruined by a mediocre set of 1990s retail pavilions; Waterloo’s huge curved concourse has sadly been compromised by a raised deck that makes it easier to admire the upstairs stonework but spoils the ensemble. The new curved concourse built on the western side of King’s Cross by John McAslan + Partners is an impressive space, but it’s too small and too hemmed in by places to eat, drink and shop. At many other London termini there is a warren of tunnels between tube and train stations but at Euston you simply turn left after the Underground ticket barriers, go up a single escalator and arrive slap bang in the middle of the Circulation hall. No doubt a newly rebuilt Euston would force you to go past dozens of retail units instead, but in the 1960s commerce was kept at bay. Away from Euston’s Concourse the subterraneous cab rank, car park and the stairs that lead to them are cheap, uninviting and dingy – but no worse than umpteen railway stations built since the 1960s. The taxis could just as easily be relocated to street level. As for the car park, you have to wonder why a terminus that is so well-connected by bus and tube needs one at all: at least the current arrangement does all it can to discourage such an environmentally malign mode of onward travel. It’s odd that the quality of Britain’s largest surviving railway station of the 1960s is almost universally overlooked by architectural writers and railway historians. Oliver Green, a railway historian who has written the definitive Discovering London Railway Stations, is simply wrong when he states that Euston has “no clear entrance route” for pedestrians, and that the Concourse’s “ambience is unwelcoming, the acres of space wasted”. Green’s right to say that the “low-roofed platforms give no sense of occasion when embarking on a journey north” but he forgets that passengers spend much more time on the concourse than on the platform. He laments the lack of seating in the Concourse but this is a problem with most large railway stations: Network Rail makes money from people sitting in Starbucks with their cappuccinos, not sitting for nothing on public benches. Green ignores the piazza just outside Euston, often lazily described as “windswept” but in reality a welcoming place fringed with places to eat and drink, and democratic picnic tables where you can eat and drink their merchandise – or, as I did recently, consume your own foil-wrapped sandwiches unchallenged. Such simple, uncommercialised public space is rare at rail termini nowadays, many of which offer no seating at all unless you spend money. The good news is that Network Rail’s CGIs of the revamped station show the tables will survive (see below), and the promise that the piazza will be “cleared of kiosks” suggests that there will be more public space, not less. All in all it sounds like £12.5m well spent. As for the “monoliths” that Ike Ijeh despises, Euston’s cluster of Richard Seifert office buildings (which were built after the station itself) are a lot more humane than the forest of 30-storey towers that the Euston rebuilding plans proposed. Admittedly some of Seifert’s office buildings are poorly -positioned and block off routes to and from the station. I wouldn’t go as far as Mark Crinson, who has written on the Twentieth Century Society’s’ website that of all London’s rail termini, Euston ” relates best to the surrounding city” and that the grid of metal fins slotted into Seifert’s facades “have an almost baroque plasticity”. But once you’re there the colonnades and piazza in front of the station work well. In terms of scale if not materials, the pedestrian approaches to Euston recall the classical colonnades which are common in most European capitals but very rare in London outside Covent Garden: demolition would be a great pity. When I visited the piazza last month a group of RMT activists were mustering for a demonstration in favour of keeping train guards. I suddenly saw Euston not as a symbol of vandalism, or failure, but as a monument to the nationalised British Rail before it was dismantled in the mid-1990s. The trains may not have always ran on time, but at least they were not run for private profit. A statue of Robert Stephenson looks on unperturbed. Somehow he belongs. It’s become a reflexive action to deplore Euston station, just as everyone automatically deplores Skoda cars, the music of Barry Manilow or Roger Moore’s Bond movies: we’ve been told so often that they’re worthless that we no longer look at or listen to them properly. A bit like The Spy who Loved Me, Could It be Magic or the Skoda Favorit, Euston deserves a second look. 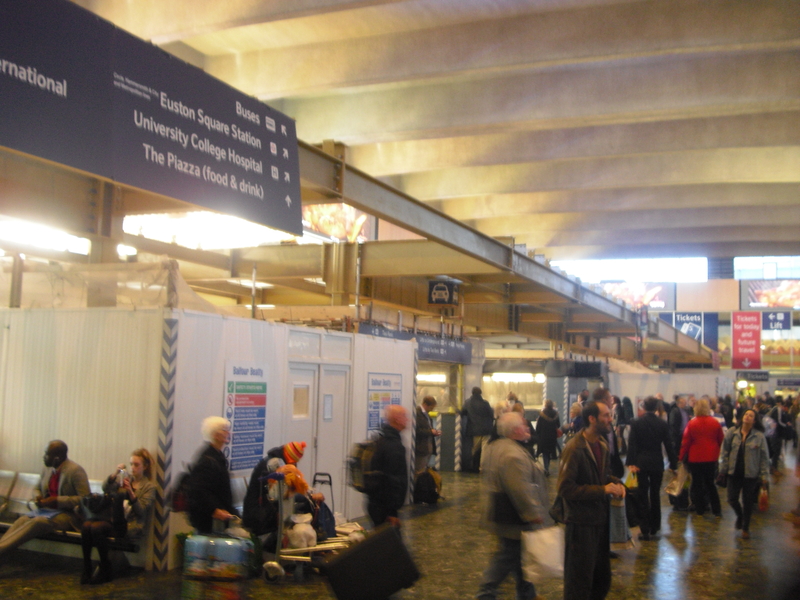 It’s far from perfect but Euston – or at least its Concourse – has stood the test of time. Euston’s defects can be easily rectified by selective demolition of some of the offices in front of the station to create a new route from a rebuilt Arch to Moorcroft’s circulation hall: the complete redevelopment of both station and the blocks in front is simply a waste of money. 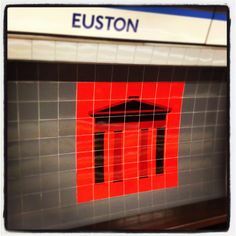 The well-intentioned Euston Arch campaign is wrong to place so much emphasis on the Arch – in fact the Great Hall of the original station was more important historically – and wrong to argue that the current station must be demolished as it “is almost invisible from the main road”. In fact the approach to the Arch and the station had already been ruined long before they were both demolished in 1962: a railway hotel built in the 1880s had completely blocked views of both from the Euston Road. Those wishing to turn the clock back to when Euston made sense as a railway terminal have to regress at least 130 years. Rather than look backwards, we should think forward about how a reconfigured Euston can include the key landmark of the Victorian station alongside the best features of its 1960s replacement. Contrary to popular belief, the 1960s station does not occupy the space where the Arch once stood, which is still open space between two 1870 lodges spared demolition in 1962. Rebuilding the Arch does not depend on the demolition of the 1960s station and, if anything, the decision not to redevelop Euston entirely should make it easier. There’s no reason why some of the money that was due to be wasted on rebuilding the station can’t be spent on rebuilding the Arch (chunks of which have already been salvaged from the canal into which they were dumped in the 1960s). Whatever hints the Chancellor may drop about a complete rebuild, Network Rail is pressing ahead with plans for an 8,000 square foot mezzanine deck in Euston’s Circulation Hall, which will clutter the space but may also allow people to take a closer look at the coffered ceiling. The steel frame is already built, and Network Rail says it will be finished by late 2015. It’s a pity that this balcony, and new “grab and go” retail units under it, will deprive the Concourse of much of its natural light, but at least it will survive more or less intact. I only hope that at least some of the unnecessary signage around its columns will be removed, the 1968 opening plaque reinstated, and details like the sea-green flooring and diagonal fretwork preserved. 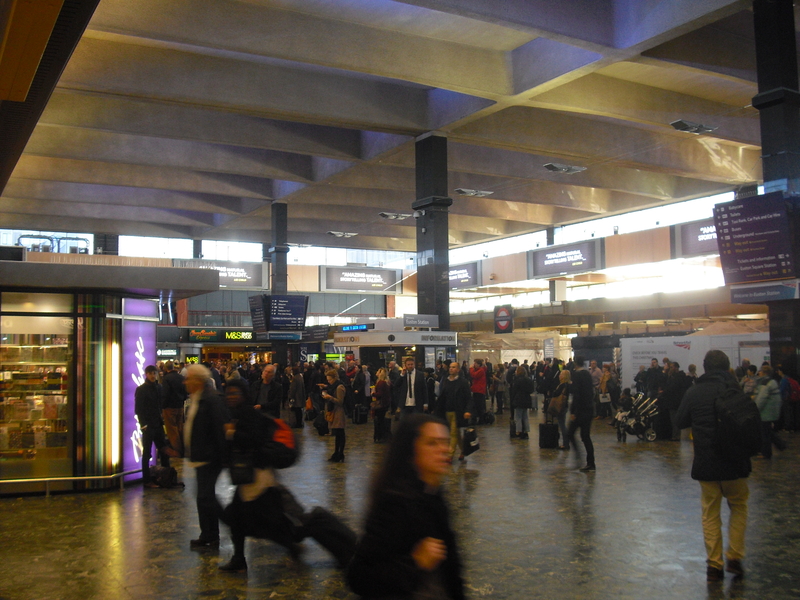 Of all London termini, Euston is the only one whose concourse largely retains its original appearance. As other icons of the early and mid-60s – the Beatles, the Profumo affair, the Mini – remain in vogue, and Mad Men has sparked new interest in the period’s aesthetics, I hope that Euston station, and Seifert’s office buildings in front of it, will soon become central London’s version of Preston Bus Station: a widely-derided “eyesore” that narrowly escapes demolition and latterly achieves classic status. It is unfair to carry on blaming the current station for the folly of its predecessor’s demolition. Of course the demolition of Philip Hardwick’s original Euston Station, and its so-called Arch, in 1962 was a tragedy. But what replaced it isn’t half bad. The thoughtless demolition of the original Euston station in 1962 cannot be redeemed by the thoughtless demolition of its successor 50 years later. In any case, Euston station’s demolition was proposed in 2007 not to accommodate HS2, but purely to make money. Euston may not yet be the busiest of London’s termini but it’s long been the most important, as the main gateway between London and four of the eight next biggest cities in Britain (Birmingham, Liverpool, Manchester and Glasgow). It’s too important to be a political football. Let’s hope that sanity prevails, the money does indeed run out and the dismal architectural history of Euston does not have another ignoble chapter. If HS2 penny-pinching means that Euston station is improved, rather than demolished and replaced by a shopping mall, then that’s cause for celebration, not regret. Those who condemn Euston Station are a bit like vandals who behead Henry Moore sculptures: they simply don’t understand the value of what they unthinkingly attack. This entry was posted in Uncategorized and tagged Architecture, Euston, History, HS2, Railway. Bookmark the permalink. Unfortunately you have made a common error regarding the site of the arch. It was not despite some misguided CGI from the Daily Mail on Euston road. The 2 existing lodges and war memorial were part of Euston square which extended up to meet with Euston Street (still partially in existance which met with Lancing Street on the far side. It was then on the other side of Euston Street that the arch and the railway complex began. Meaning the arch was roughly where the escalators for the tube are now. You can see the square and arch on maps of the time, including historical ones on google maps. Thanks for pointing this out. Point taken about the original location of Euston Arch. However, it’s true to say that the proposed location for its re-erection does not require, or depend upon, the demolition of any part of the 1960s station or the office buildings in front of it.